After an eight-day player and all-star break, the Winnipeg Jets resume their schedule by visiting the Philadelphia Flyers tonight…The Jets lost 4-2 to the Dallas Stars on Jan. 19 in their last game before the break…Winnipeg plays their second game in as many nights tomorrow against the Boston Bruins. The Jets are third in the NHL with 66 goals in the third period this season…Winnipeg’s plus-19 goal differential in the third period is tied for second in the league…The Jets have scored in the third period in eight consecutive games (15G), including two goals in three consecutive games…Patrik Laine leads the Jets with 10 goals in the third period this season. The Jets are 13-9-0 on the road this season and play their third of four consecutive road games tonight…Winnipeg has lost three of their past four road games, but are 9-4-0 in their past 13 games away from Bell MTS Place…Winnipeg hasn’t lost three consecutive road games in regulation since Dec. 10-20/16…Blake Wheeler leads the Jets in scoring on the road this season with 23 points (3G, 20A) in 22 games, while Patrik Laine has a team-leading 16 goals in 22 games. The Jets begin a stretch of 11 games in 20 days tomorrow…Winnipeg went 6-3-0 in nine games in 16 days leading into the break…The Jets play their last 34 games of the regular season in 69 days. The Jets are 11-5-1 against Eastern Conference teams this season, including 7-2-0 against the Metropolitan Division…Winnipeg plays seven of their next nine games against Eastern Conference teams…Winnipeg went 19-7-6 against the Eastern Conference last season, including a 10-3-3 record versus the Atlantic Division and 9-4-3 record against the Metropolitan Division…Blake Wheeler leads the Jets with 21 points (1G, 20A) in 16 games against the Eastern Conference, while Mark Scheifele has 19 points (11G, 8A) in 16 games. Tonight and tomorrow marks the seventh of 10 back-to-back sets the Jets have this season…Winnipeg is 4-2-0 in the first game and 4-2-0 in the second game of back-to-backs this season…Last season, the Jets went 4-3-2 in the first game of nine back-to-backs and 4-4-1 in the second game. The Jets haven’t scored a power play goal in their past three games, going 0-for-11, and have been held without a power play goal in 11 of their past 15 games…Winnipeg is 17-for-19 (89.4%) on the penalty kill in their last four games. Blake Wheeler is second in the NHL with 52 assists this season…His 1.08 assists per game this season is a career high…He needs 16 assists to match the career high of 68 assists he had last season…Wheeler’s 36 primary assists are also second in the NHL this season…During the past four seasons, Wheeler leads the NHL with 220 assists and 154 primary assists in 293 games. Brendan Lemieux (3G) has scored in back-to-back games…It’s the first time in his career that he has a point in back-to-back games…Linemate Mason Appleton (1G, 1A) also has points in back-to-back games for the first time in his career. Jets forwards Blake Wheeler and Mark Scheifele and head coach Paul Maurice represented the Jets as members of the Central Division at the NHL All-Star Game in San Jose last weekend…Wheeler had three assists and Scheifele scored in their 10-4 win against the Pacific Division in the semifinal…In the final, Wheeler scored, but the Central Division lost to the Metropolitan Division 10-5…It was Wheeler’s second all-star appearance, while Scheifele participated for the first time. The Jets have won three of the past four games against the Flyers. 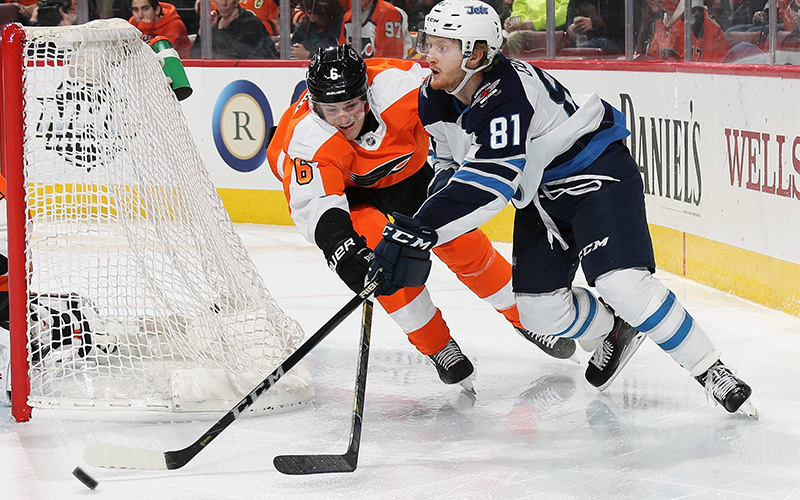 The Jets have allowed two goals or less in each of their past four games against Philadelphia. Winnipeg is 6-for-23 (26.1%) on the power play in its past four games against the Flyers. The Jets are 12-for-13 (92.3%) on the penalty kill in their last five games against the Flyers. Blake Wheeler leads the Jets in career scoring against the Flyers with 26 points (5G, 21A) in 32 games. Mark Scheifele is averaging more than a point per game in his career against the Flyers with 13 points (3G, 10A) in 10 games. Winnipeg’s Mark Scheifele and Philadelphia’s Sean Couturier were chosen consecutively in the 2011 NHL Draft, seventh & eighth overall. The Jets’ Tyler Myers played with Flyers’ goaltender Michael Neuvirth during the 2012-13 and 2014-15 seasons in Buffalo. Flyers forwards Dale Weise and Nolan Patrick are from Winnipeg and played their midget hockey for the Winnipeg Thrashers. Flyers defenceman Travis Sanheim is from Elkhorn, Manitoba. The Jets’ Jacob Trouba and the Flyers’ Shane Gostisbehere won a gold medal at the 2013 World Junior Championship playing for USA. Jets defenceman Dustin Byfuglien and forward Blake Wheeler played along side Flyers forward James van Riemsdyk at the 2016 World Cup of Hockey.